Nearly 300 years ago, two great alliances collided on the Great Plains in a battle that changed the course of American history. But until now, no physical evidence of the storied conflict had ever been found. In the summer of 1720, where the Platte River meets the Loup in eastern Nebraska, Spanish soldiers, New Mexican settlers and their Pueblo and Apache allies clashed with warriors from the Pawnee and Oto nations of the Plains. In a daybreak raid, the Pawnee and the Oto — possibly with the support of French traders — routed the Spanish, killing their commander, Don Pedro de Villasur, along with 35 soldiers and 10 Pueblo scouts. The attack proved to be a turning point in the Spanish conquest, marking the end of the empire’s eastward encroachment across the continent. Villasur’s defeat was well-documented by survivors at the time, but perhaps nowhere was it more famously captured than in a pair of intricate tableaux painted on bison hides. 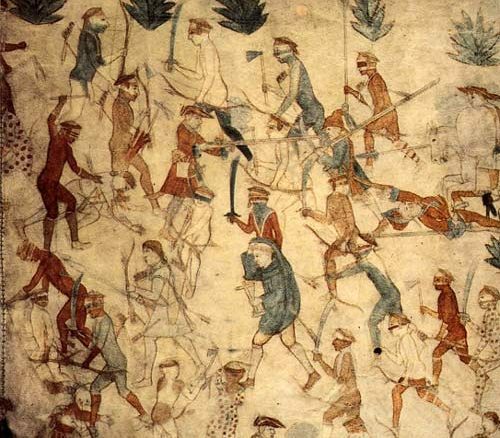 A detail in the second of the two bison hides — known as the Segesser Hide Paintings — depicts the attack on Villasur’s party in eastern Nebraska. The hides are now housed in Santa Fe’s Palace of the Governors museum. Until now, the paintings have been the most vivid remaining records of the momentous battle. But archaeologists say they’ve found what they think are its first known, if somewhat unexpected, artifacts: fragments of Spanish olive jars. 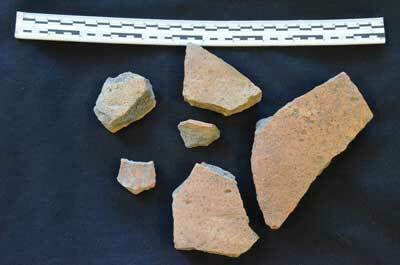 Discovered in suburban Omaha at a site called Eagle Ridge, more than a hundred kilometers from where the battle likely took place, the sherds are the only tangible relics of this pivotal episode in Plains history, said Dr. David Hill, of Metro State University, in an interview. Such jars, or boijas, were traditionally used for shipping olives, but in the New World, settlers recycled them as vessels for all sorts of supplies, like medicine, oil, and wine. The widespread use of boijas in Spanish territory allowed Hill to compare the Nebraska fragments with other jars found in Texas and New Mexico. His analysis revealed important similarities among the samples, like granite-based sand that had been added to the pottery mixture, unlike indigenous ceramics made using natural clays, and telltale horizontal “throwing marks” that are still visible on the vessels’ interiors. Hill will publish his findings in an upcoming edition of the journal Kiva, with co-authors John R. Bozell and Gayle F. Carlson of the Nebraska State Historical Society. The artifacts they’ve identified, they write, “represent physical evidence for the easternmost expansion of the Spanish Empire in North America in the eighteenth century. Must the word “incursion” be used to describe Spanish movement onto the Great Plains ? The negative implications of Spanish exploration and settlement often seem to color historical interpretation of colonial activity. What about the French and British. Why are the Spaniards the “bad guys” ? Camilo, thanks for pointing this out. I used the term that appears in Dr. Hill’s paper, and he also approved a draft of this article. But you’re right that botija is the Spanish word for a food container. It might have just been a typo; I’ll check with Dr. Hill. Thanks again. Perhaps it is because we usually read accounts written by U.S. or U.K writers who come from cultures that had viewed and experienced the Spanish as adversaries, military, political, cultural and economic, for a few hundred years? Thank you, John. I couldn’t have said it better myself. This site reflects much of the worst kind of popular history writing and naturally follows the “black legend” concept when treating the colonial Spaniards. All the years I taught New Mexico History, I never thought of the Villasur expedition to the Platte River as “Spain’s eastward expansion.” I have always believed that the Spanish were more interested in finding out if the French were arming Natives in the area. I seriously doubt from all I know about the incident and about the Spanish Southwest, that the Spanish had any inclination of settling the area. They could barely populate the area that today is Texas. Plus they already had Florida, which is very much eastward of the Spanish Southwest. I had at least one ancestor who died at the battle between the Platte River Natives and the Spanish/Pueblo forces, so I’m always interested in it, but this article is greatly flawed. First of all the pawned village that attacked the expedition was north of schyler ne. I know this cause as a kid we would find Indian arrow heads in the corn fields that we detassaled 40 yrs ago. Second I think the battle happened between where the loup and platte meet today because a friend of mine found a damascus spun flint fired pistol out mushroom hunting 10 yrs ago. The pistol is so unique you can see how it was made with a rod and pounded the metal into place. What a find. Just curious, where was your friend when he found the gun? I also think Villasur was somewhere in that area and have heard of finds around that area of town. Thanks!